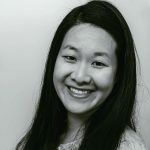 Published Mar 6, 2018 By Julia 5 CommentsThis post may contain affiliate links. 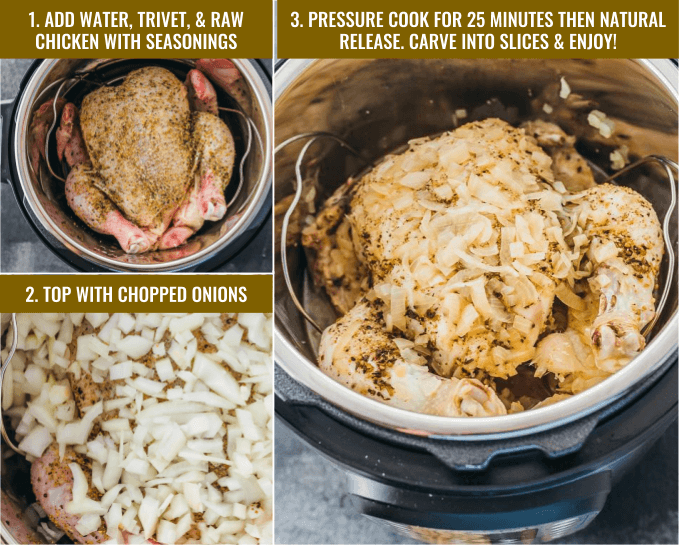 Learn how to cook a whole chicken (fresh or frozen) in the Instant Pot pressure cooker for tender rotisserie style meat. 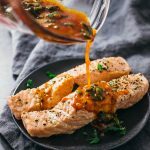 Low carb, keto, gluten free, paleo, and whole30 compliant. 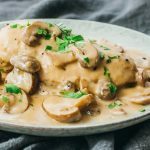 I usually opt for boneless and skinless chicken breasts when making quick chicken skillet dinners on weeknights, like Instant Pot chicken tikka masala or Instant Pot chicken with creamy mushroom gravy. Chicken breasts are readily available, hassle free, and easy to prepare. But they come at a price: they are never as juicy and tender as meat carved from a cooked whole chicken. 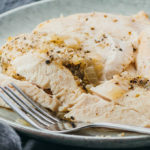 Whether you roast or pressure cook a whole chicken, the meat comes out fabulously moist and juicy, so good that I can enjoy it with only the barest of seasonings — certainly not something I can say for chicken breasts. 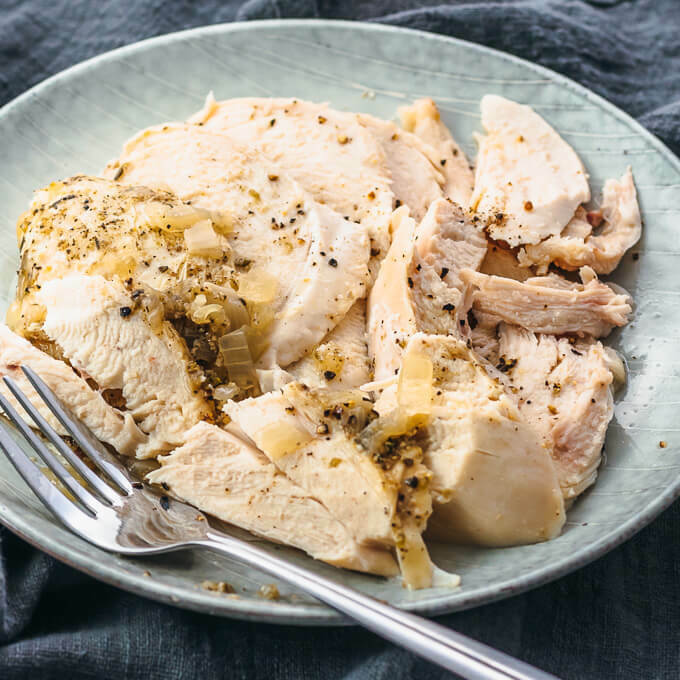 The Instant Pot makes it effortless to cook a whole chicken, and you can use fresh or frozen meat (read on for cooking times). This pressure cooker version is adapted from my traditional roast chicken with vegetables recipe. It’s simple: add water (anywhere from 1 to 2 cups works well for my 6 quart Instant Pot) and place the trivet inside, rub seasonings over the chicken and place on the trivet, top with some onions, then pressure cook for 25 minutes. Voila, dinner is ready. This is one of those recipes where simple is best. 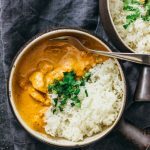 The natural chicken flavor really stands out and there’s no need to slather a bazillion seasonings all over to give it flavor. I usually rub the chicken with a simple salt, pepper, herb, and garlic seasoning. Treat the amounts listed in the recipe as a guideline; use however little or as much seasoning as you prefer. The chicken will be delicious either way. How long does it take to cook a whole chicken in the pressure cooker? What’s the cooking time if frozen? The recipe assumes a store-bought whole chicken weighing 4.5 – 5 pounds, fresh not frozen, and the appropriate cooking time is 25 minutes at high pressure followed by a 15 minute natural pressure release. 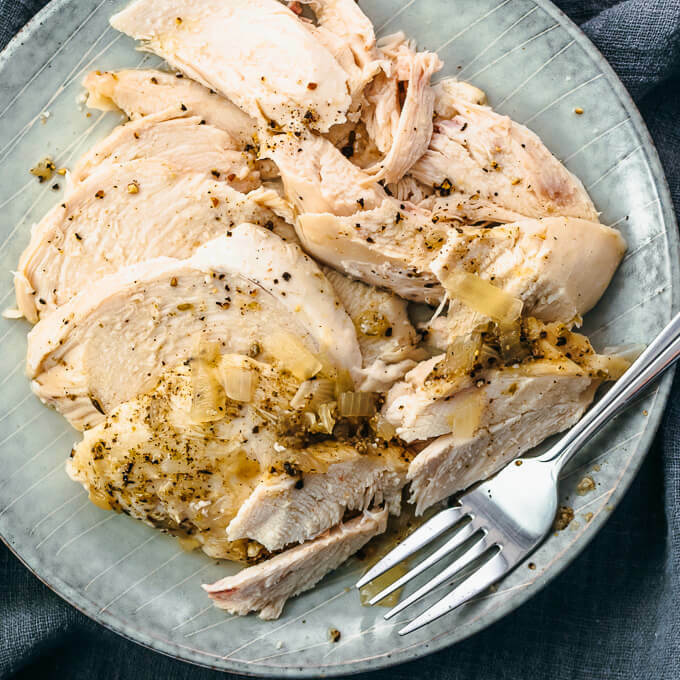 If you can’t find a whole chicken in that weight range, you can modify the recipe’s pressure cooking time using this rule of thumb: add or subtract 6 minutes of pressure cooking for every pound. So if your chicken is 5.5 – 6 pounds, the pressure cooking time should be 31 minutes. 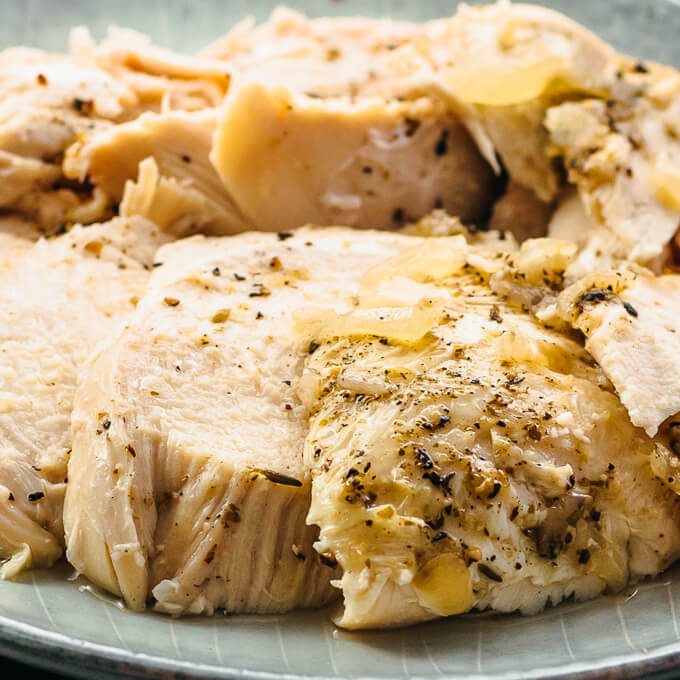 If you’re using frozen chicken, you’ll need 10 minutes of pressure cooking for every pound. For example, a 4 pound chicken would need 40 minutes of pressure cooking. When you’re looking for a whole chicken at the supermarket, note that either a “broiler” or “roaster” chicken is fine — just pay attention to the weight. Anything too large may not fit in your pressure cooker. I use a 6 quart Instant Pot and I wouldn’t buy a chicken heavier than 5 pounds. Can you cook vegetables with the whole chicken in the pressure cooker? I add onions to the pressure cooker with the whole chicken, but their purpose is to infuse flavor into the chicken, not so that I can have vegetables as a side dish. If you’d like to have vegetables to serve with the chicken, I recommend that you cook them separately. 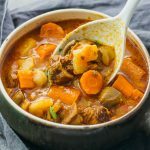 I’ve experimented with cooking vegetables in the Instant Pot and they always get much too soft and mushy. You won’t get a nice crisp finish. Side vegetables that work well include carrots, celery, parsnips, leeks, radishes, and squashes. 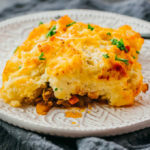 You can add potatoes for those of you who aren’t low carb like me. For recipe ideas, check out mashed cauliflower and Instant Pot green beans. Strain and save the liquid in the pressure cooker pot for future use as chicken stock. Save the bones from the chicken to make bone broth. Any liquid released by the chicken during the carving process can be saved and turned into a gravy. If your chicken came with giblets (they’re usually packaged in a plastic bag inside the cavity), you can fry them or make giblet gravy/broth. Cook a whole chicken (fresh or frozen) in the Instant Pot pressure cooker for tender rotisserie style meat. 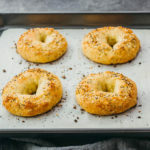 Low carb, keto, gluten free, paleo, and whole30 compliant. Add 1 1/2 cups of water to the pressure cooker pot. Place a trivet inside with the handles resting on the sides of the pot. Clean the chicken and remove any giblets. Pat the chicken dry with paper towels. Brush or rub olive oil over the chicken breast, legs, and wings. In a mixing bowl, combine dry seasonings and mix well. Rub the seasoning mix over the oiled chicken. Place the chicken on top of the trivet in the pot, breast side up. Evenly distribute chopped onions on top of the chicken. Secure the lid and seal the vent. Cook for 25 minutes at high pressure, followed by a 15 minute natural pressure release. Uncover and use the trivet’s handles to carefully lift the chicken out of the pot. Carve up the chicken and place the meat on a serving platter. Spoon liquid from the pot over the sliced chicken and season with additional salt and pepper to taste. 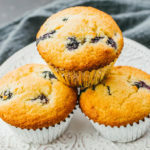 This recipe yields 3.5 g net carbs per serving. Nutrition information assumes that a 4.5-5lb chicken has about 25 ounces of edible meat from the breast, legs, and wings. This was very good, I made it for supper tonight. Used the herbs listed and also added in some McCormick Rotisserie seasoning as I had it on hand. It was very moist and fell apart, I am new to Instant pot cooking, this was my first attempt at cooking meat in the pressure cooker. Thanks for sharing! If I’m cooking a frozen chicken, is it ok for the giblets to still be inside? Or do I need to pry them out?? Hi Katrina! I’d remove the giblets before pressure cooking. Way easier than roasting a whole chicken. Thanks for the recipe!